Showing results for tags 'mpide'. Hello Guys! I hope you can help me with some doubts. I am programming the Digilent card to use with internet, however the library the Chipkitethernet library is showing the following errors: Some time ago I had compiled this code in MPIDE and it worked, but I changed the computer and lost the libraries and MPIDE. Now I'm having this error. In file included from program_murilo.cpp:3:0: C:\Users\LSI\Documents\mpide\program_murilo/chipKITEthernet.h:109:18: error: conflicting return type specified for 'virtual void Client::write(uint8_t)' C:\Users\LSI\Desktop\Murillo Gentil\mpide\mpide-0150\hardware\pic32\cores\pic32/Print.h:48:20: error: overriding 'virtual size_t Print::write(uint8_t)' C:\Users\LSI\Documents\mpide\program_murilo/chipKITEthernet.h:111:18: error: conflicting return type specified for 'virtual void Client::write(const uint8_t*, size_t)' C:\Users\LSI\Desktop\Murillo Gentil\mpide\mpide-0150\hardware\pic32\cores\pic32/Print.h:53:20: error: overriding 'virtual size_t Print::write(const uint8_t*, size_t)' C:\Users\LSI\Documents\mpide\program_murilo/chipKITEthernet.h:147:16: error: conflicting return type specified for 'virtual void Server::write(uint8_t)' C:\Users\LSI\Desktop\Murillo Gentil\mpide\mpide-0150\hardware\pic32\cores\pic32/Print.h:48:20: error: overriding 'virtual size_t Print::write(uint8_t)' C:\Users\LSI\Documents\mpide\program_murilo/chipKITEthernet.h:149:16: error: conflicting return type specified for 'virtual void Server::write(const uint8_t*, size_t)' C:\Users\LSI\Desktop\Murillo Gentil\mpide\mpide-0150\hardware\pic32\cores\pic32/Print.h:53:20: error: overriding 'virtual size_t Print::write(const uint8_t*, size_t)' somebody coud help me? Regards. I am unable to upload projects to my chipkit pro MX4 board using MPIDE. My code compiles, I have the correct board selected and comport. However when I try to upload my project to the board I get an error saying that it cannot connect to the comport and to shut down applications that are using it. Has anyone set up MPIDE and used the chipkit pro MX4 board? Any Working TFT with uC32? I recently successfully completed a web server application for the chipKIT WF32 using the Digilent IP stack with the Arduino IDE. I wanted to see how difficult it would be to port the same web server application to the chipKIT PRO MX7 processor board. There appeared to be only a one or two lines of code that had to be commented out to make the conversion. 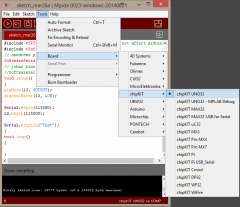 The The Adruino IDE reported "No target found". So I backed off to the simple "ChipKIT_Blink" sketch and had the same result - "No target found". I reverted to the MPIDE environment using the same hardware and the sketch loaded and ran correctly. So I'm thinking the problem is with the Arduino IDE or the chipKIT core library. 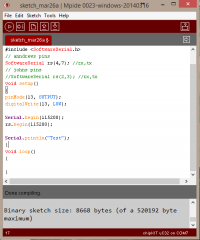 I am using Arduino rev 1.6.5 and chipkit-core-windows.16778041.v1.0.0-21-glc4b889.zip. Keith recommended removing R159 (no easy task for an older person and glued down R402 resistors.) 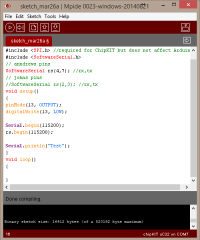 Has anyone had any success programming the chipKIT PRO MX7 using the Arduino IDE? Compile errors indicate the wrong hardware is selected. double-check the correct board with this drop-down menu. Hello, noob here I just started a project for my university BEng and is based on the chipKit WiFire provided by my supervisor. So far, i felt in love wth MPIDE because is so easy to use and it has all ready for me with 1 exception. The Flowcloud library. For the first 2 months and so I just figured out how to use MPIDE because the boards were from flowcloud so the USB-to-serial cable didn't work so I burned the Bootloader with Digilent's firmware. But now, I lost the Flowcloud app from the PIC chip that my project depends on so much because is required to use a cloud service. Anyhow, my request is: Can someone please tell me how to add the Flowcloud libraries and example codes/functions to work with MPIDE? I really hate MPLAB X because is so complicated and has no examples. Thank you in advance. P.S. I already talked in Flowcloud developer forum about this issue but they told me this is Digilent/chipkit's domain to integrate flowcloud/MPLAB Harmony libraries with MPIDE.